The cornerstone of Martin, Jean & Jackson was set in Ponca City, Oklahoma over thirty-five years ago. Over the years, our efforts have led to thousands of injured or victimized clients receiving the compensation they deserved. Today, Martin, Jean & Jackson is Oklahoma's premier injury law firm. We have devoted our practice to the representation of people injured in accidents or harmed by a company's negligence. We are proud to have attorneys and staff who take personal pride in representing injured or victimized parties, protecting their legal rights and collecting compensation for their personal losses. Our philosophy for legal representation is second to no other law firm in the state. We are an experienced personal injury law firm dedicated to achieving maximum results for our clients. Preparation in each case is key. Early and aggressive preparation lets the other side know we intend to fight for our clients and win. More often than not, we get the other side to settle the case before even filing a lawsuit. Equally important is our goal to keep our clients advised throughout the entire process. Through letters and personal phone calls, we strive to work with the client as we work towards a successful result in each case. Your involvement in your case is important to ensure complete representation of all your legal claims. 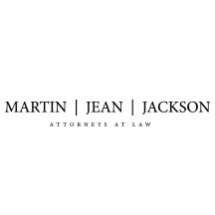 Above all, at Martin, Jean & Jackson we believe that once a client, always a client. This means we are there for you no matter what your legal concern. Even if your concerns are in an area of law besides personal injury, we are ready to get you the best legal advice available from other qualified attorneys. Our attorneys and staff are ready to meet with you at no charge and discuss your case. On behalf of Martin, Jean & Jackson we look forward to becoming your "Attorney for Life."